Must cool for an hour at room temperature or 20 minutes in the refrigerator. Place the coconut concentrate, warm water, olive oil, garlic cloves and salt in a blender and blend on high for a minute or two, until the sauce thickens. Let cool for an hour at room temperature – alternately, you can place it in the refrigerator for 20 minutes. If you would like to use the sauce in a cold dish, thin with water until the desired consistency is reached. Stores well in the refrigerator, but hardens. Let come to room-temperature or warm gently before using. Combine the mayo, apple-cider vinaigrette, lemon juice, turmeric, ginger, and sea salt in a bowl and whisk to combine. Add the chicken breast, red onion, and raisins and stir. OMG this looks amazing! I’ve been trying to come up with an AIP “mayo” and have majorly failed (too many times to count). I can’t wait to try this and see the rest of the recipes in your book. Let me know how it goes! It was a major breakthrough for me, hope you like it! I made this last night for lunch today and it is SO GOOD! I was worried that the chicken would taste too coconut-y but it’s the perfect flavor combination. And so easy. I put it over mixed greens with the apple cider vinaigrette recipe from the book. THANK YOU!!! Is there any way to be notified when its for sale? I don’t get to blogs or FB as often as I should to always keep up and I so don’t want to miss getting this ASAP! Thanks! Sign up for my email list in the right hand column – there should be some big news next week! Thanks! I’ll order that tonight or in the next few days! Hello! I am loving your cookbook. I was just needing clarification on what exactly coconut cream is. Is it the cream from the top of a can of coconut, or is it the butter that has all of the oil and meat? Coconut is a hard one – lots of people are sensitive to it! If there is a recipe that calls for the oil, just replace with another solid cooking fat, like lard, tallow, or duck fat. Unfortunately I haven’t found a replacement for the creamy dressings – I am experimenting with cauliflower, but it just isn’t the same. Nightshades are so hard to give up – they are my favorite too! I have realized though, through the process of being on AIP long term that they aren’t worth the pain they cause me. Good luck, and let me know if you come up with any good substitutions! I just made the “garlic mayo” with avocado instead of the coconut cream [on Mickey’s suggestion] for the sweet potato fries. It came out like really light & fluffy guacamole. I think it is good with the chicken, and hopefully with this recipe – as that was what I was just thinking about making & hoping it would be a good combination. Good luck! Thanks for sharing your feedback here, Joanne! I am trying this recipe with your sweet potato fries recipe tonight! I can’t wait! I have hashimotos, adrenal fatigue, CFS, and fibro and have been faithful to a ketogenic version of the paleo diet for quite some time. It has helped a lot but hasn’t been enough. Only just today have I discovered AIP and although it’s depressing how many foods I have to give up (I just adore heirloom tomatoes, eggs, and pumpkin seeds! This is going to be tough! ), I’m excited to see what results I might gain. I hope I can get my hashimoto’s into remission and finally have some energy again! I’m only 21, and I feel 60 sometimes lol. I hope this is the missing piece to my feeling better. Thank you so much for posting these recipes, I cannot wait to buy your book! Also, if you have the chance, do you have any suggestions on how I can do AIP and keep it ketogenic? I’m trying to eat around 120 grams of healthy fats a day and removing eggs and nuts, seeds, and all forms of dairy may make it a little difficult. (though I notice I tolerate dairy very well, so I may not eliminate it, despite it not being paleo.) I’m guessing upping the amount of coconut products and avocados I consume will help? To keep the AIP ketogenic, stick with lots of low-carb veggies like carrots, summer squash, broccoli, kale, cauliflower, cucumber, lettuce, olives, celery, radishes, etc prepared with lots of healthy fats. You might want to make some pureed carrot or cauliflower and add lots of coconut oil and have that on hand for a snack. Avocados are awesome! Making sure to include fatty portions of meat is also important. Good luck! I live in Seattle. Where do you find the coconut butter/cream. I tried one from Trader Joes but it was funky. I was trying to make the coconut whip cream like other sites suggest but it turned out awful. Any suggestions? I make coconut butter out of shredded coconut flakes in my vitamix. Whole foods has coconut manna made by nutiva which works for coconut butter or cream. I don’t believe I have seen any at Trader Joes. How do you make your own butter? I am guessing adding coconut oil to the shredded coconut…Amounts? I hope to try this dish over the weekend. I use a couple of cups shredded coconut and a tablespoon of oil. It doesn’t work in a standard blender, but a high-powered machine or a food processor should do the trick! Love the mayo. The dressing is very flavourful. I am enjoying your blog, and look forward to the publication of your book in hardcover. I am wondering about substitute spices for those avoiding turmeric? Thanks! I would just leave it out – it will have a different flavor but still tasty. THANK YOU! I have an egg allergy and the one thing I really miss is mayo. This sounds yummy and easy to make! Can’t wait to try it! 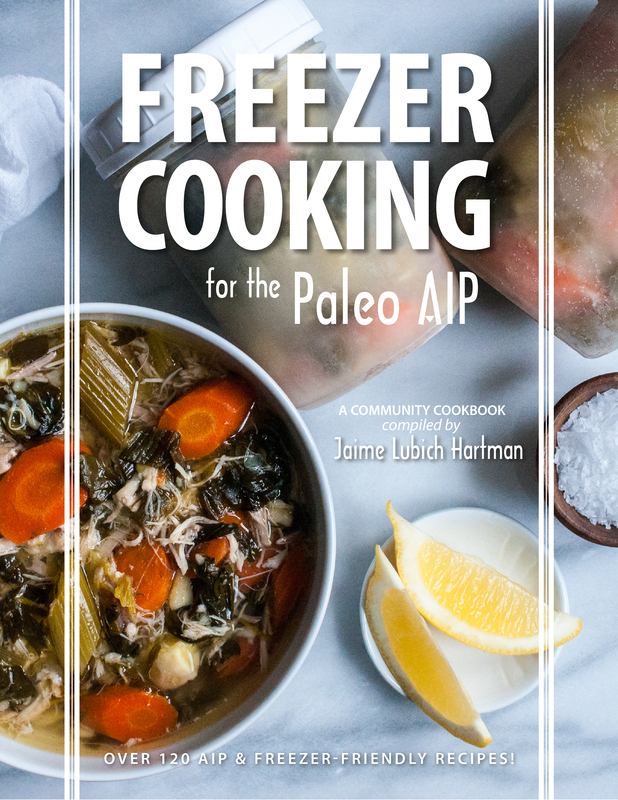 Isn’t whole garlic contraindicated on the autoimmune paleo diet? I’ve made garlic infused olive oil to flavor foods but I thought the clove itself was to be avoided. Garlic is fine, unless you personally don’t tolerate it. SO good! Almost through week one of the four week plan. I’m loving all the recipes, and the simplicity of meal planning. I’m cooking for my family of four with two young boys, so I’m multiplying all the quantities by at least four. Thank you, and I wish you all good luck! this is unbelievably good!! i am having it for lunch right now and it has so much flavor!!! definitely one of my favorite chicken salads. Sweet potatoes are not nightshades, and starch itself is not excluded in the Paleo diet or AIP. That being said, some people react to it, and if that is you I don’t recommend eating it. There is no actual chili spice in my recipe, which is why I put it in quotes–“chili”. Like a chili but not quite. Hope it helps! Hi Christie! It sounds like you are not using coconut concentrate for the mayo, but instead the coconut cream that is at the top of a can of coconut milk. I use Nutiva brand coconut butter (otherwise known as coconut concentrate or manna). Hope it helps! Can not find the Shredded Chicken Breast recipe. When I open the recipe from the menu, it brings up the Chicken Curry dish. Can you please post the recipe for Shredded Chicken Breast ? I just cook the chicken breast in a skillet in about 1/2 cup of broth, covered, and flipping once or twice, until cooked throughout (about 10-15 minutes depending on the size of your breast).